Few actresses have smoldered on screen and in photos like Marlene Dietrich. The star knew lighting, how to work her angles and melted the lens. Jewelry was one of the props she used effectively throughout her career to make the pictures more potent. Dietrich did not go for small delicate pieces. Her jewels were huge statement making creations. Many of them, as you might imagine, were gifts from her long list of lovers, which adds an element of intrigue. In Alfred Hitchcock’s 1950 murder mystery Stage Fright, the actresses flaunted one of the largest jewels in her collection, a Van Cleef & Arpels Jarretière ruby and diamond bracelet. 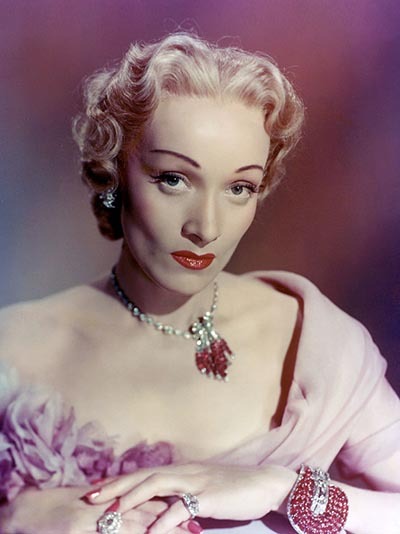 Dietrich who was 49-years old at the time the film debuted, played an aging actress who has driven her young lover, Jonathan Cooper (Richard Todd), to murder her husband in a fit of jealous agitation. Like Dietrich in real life her character, Charlotte Inwood, had clearly been the recipient of many significant jewelry gifts. During the daytime scenes, Dietrich wears narrow diamond chokers, one combined with pearls. For her performances on stage, she flaunts two magnificent suites of diamond jewelry with her costumes that were designed by Christian Dior, the man himself. Like the rest of Dior’s couture made during the era, the gowns had a wide décolletage, tapering bodices, cinched waists and very full long skirts. Hitchcock, who clearly had a jewelry obsession, made Dietrich’s jewelry a highly visible part of her character. Not only does she wear it, she works it. The clicking of a gem-studded compact in the first scene and the taking of a cigarette from a case in the last scene, where she acknowledges her role as a witness to a murder, are mannerism that do not propel the plot, but develop her persona. When Dietrich tells her assistant in the movie, played by Jane Wyman, that the police want to question her, she is repairing (yes, repairing) the clasp of a Cartier diamond bracelet. The only time jewelry enters the dialogue in Stage Fright is when Dietrich offers some to Wyman in an effort to blackmail her. 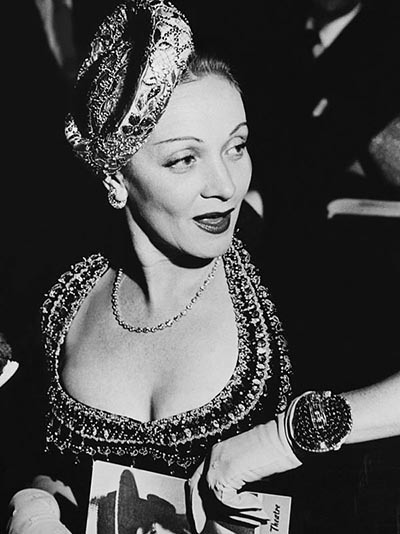 In one of the most explosive scenes in her dressing room, Dietrich tells an enraged Todd to leave the country, she attaches a Van Cleef & Arpels ruby and diamond clip brooch to her diamond necklace. When he announces he has not destroyed the blood-soaked dress that would implicate her in the crime, she nervously puts on her matching ruby and diamond Jarretière bracelet. Watch in the trailer below, the moment happens about one minute in to the clip. 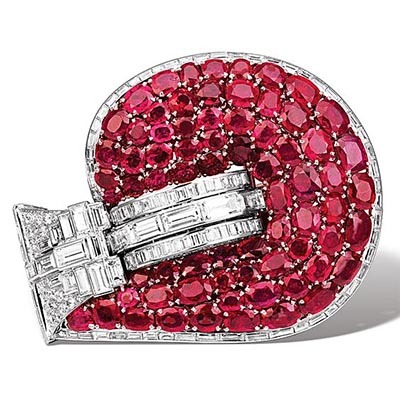 The huge cushion-cut ruby disk on the bracelet was rimmed with baguette-cut diamonds. The buckle portion of the jewel is composed of baguette, rectangular and pavè-set diamonds. Attached to the bracelet are twin tapering circular and baguette-cut diamond bands, the flexibility of which can be seen in the video clip. The underside of the ruby disk is a flaring pavè-set diamond cone shape that rises to turreted motifs, accented by baguette-cut diamonds. The jewel was mounted in platinum. There are other exceptional Jarretière bracelets. The Duchess of Windsor had a diamond and sapphire rendition made in 1937. She wore hers on her wedding day. Van Cleef & Arpels made the bracelet as a sparkly play on a bride’s garter or jarretière which is the French word for the piece of lingerie. 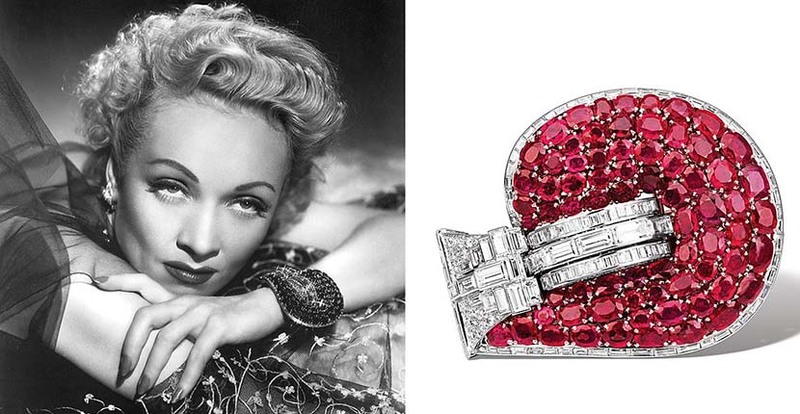 On Dietrich, the concept of a jarretière goes from bridal to bombshell. Her jewel may not be as refined as the Duchess’ but it is definitely bolder. No other Jarretière had the height and the depth the conical back portion of the jewel provided. The exceptional quality of the jewel was recognized in the hammer price for the piece when it sold for $990,000 at Sotheby’s in 1992. 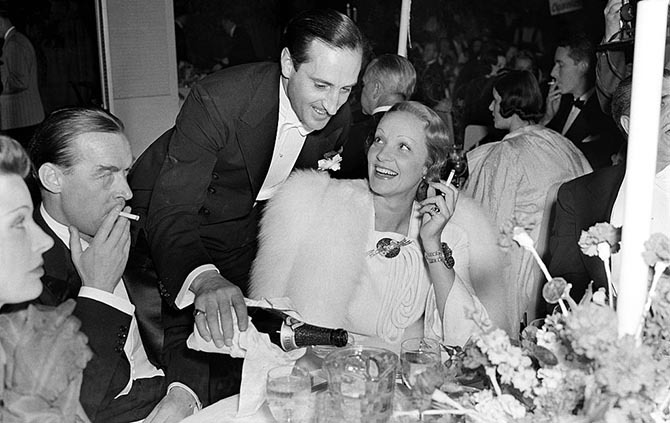 Shortly after the jewel was created in 1937, Dietrich wore it on evenings out on the town and to the theater. She also wore it to the 1951 Oscars. According to family tradition among all the jewels in her collection, the Jarretière bracelet held a special place in her heart. Perhaps a sign of a love affair? That is one jewelry mystery that may never be solved.